The FlashLantern has a clear, solid fiber-optic mantle containing a circular prism which disperses light effectively. The mantle eliminates several breakable parts of traditional lanterns including mantles, globes and bulbs. 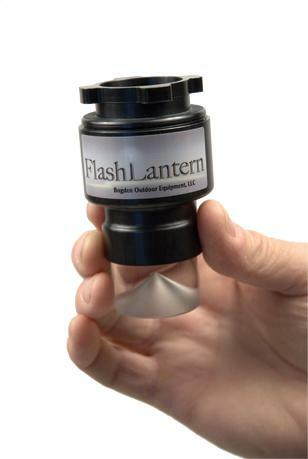 The FlashLantern uses an LED flashlight as its power source. 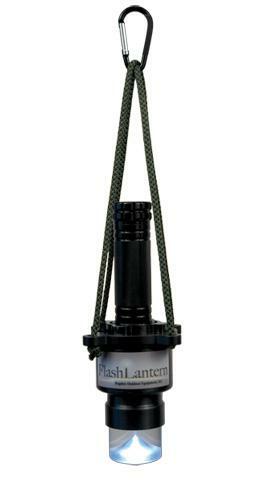 The bracket holds the FlashLantern in an inverted position from a rope harness and has a quick release for hand use. 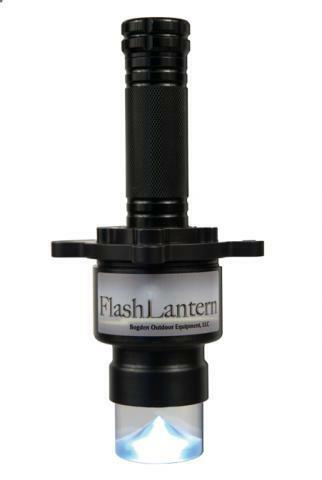 The FlashLantern provides for maximum light with a minimum size and weight. Flashlight recommendations: For use with LED flashlights only. Beware of LED flashlights that warn of heat buildup or damage with extended use. Tail cap switches are suggested. Step 1: Hold the bracket flat side down. Knot one end of the rope and insert the unknotted end up thru the bottom of the south hole. Insert the rope down thru the North hole, up thru the East hole and down thru West hole. Knot the end and clip the top loops together with the carabiner. Step 2: Insert the flashlight down thru the base. Use the base reducer if the flashlight head drops thru the base. Step 3: Screw on the top of the FlashLantern. Step 4: Insert the handle of the flashlight up thru the bracket and twist counter clockwise.